The President and his administration bade a fond farewell to the Attorney General Jeff Sessions as he tendered his resignation at the request of President Trump. The GOP gave Sessions a request for a formal special counsel investigation into the FBI and the others implicated by disgraced former FBI agent Peter Strzok who was revealed to be about as anti-Trump as they get. Despite this request coming from the people of America, Sessions refused and in even neglected his duty at times such as when it came down to the Net Neutrality law. Here is what Senator Jim Jordan thinks about the request to resign by President Trump to Attorney General Jeff Sessions, "I think it was appropriate, the action that was taken today." Sessions and several other recently Republican government officials have refused to carry out their job and fulfill the oath they swore when they took office including Chief Justice John Roberts and Justice Brett Kavanaugh who recused themselves from the Net Neutrality issue. In 2016, Sessions recused himself from the control of the investigation of Russian interference in the 2016 presidential campaign. What is up with all of the Republicans recusing themselves whenever an important matter comes up? We the people elected you to do conservative things and yet every time an important issue comes along you recuse yourselves. Sessions wrote a letter to the President that said he had been "honored to serve as Attorney General" and had "worked to implement the law enforcement agenda based on the rule of law that formed a central part of your campaign for the presidency." Trump tweeted later that day that Sessions would be replaced on an acting basis by Mathew G. Whitaker who served as Session's chief of staff. Trump added on Twitter, "We thank Attorney General Jeff Sessions for his service, and wish him well! A permanent replacement will be nominated at a later date." A Justice Department spokesperson said Whitaker would indeed assume authority over the special counsel probe into the 2016 Russian interference although such an action would come under intense scrutiny by ethics officials. Since Sessions recused himself, the special counsel probe had been overseen by Deputy Attorney General Rod J. Rosenstein, who has also had some significant problems including complying with the Senate Judiciary Committee during his hearing recently. It is known that Rosenstein was seen headed to the White House Wednesday afternoon for what one official said was a meeting. 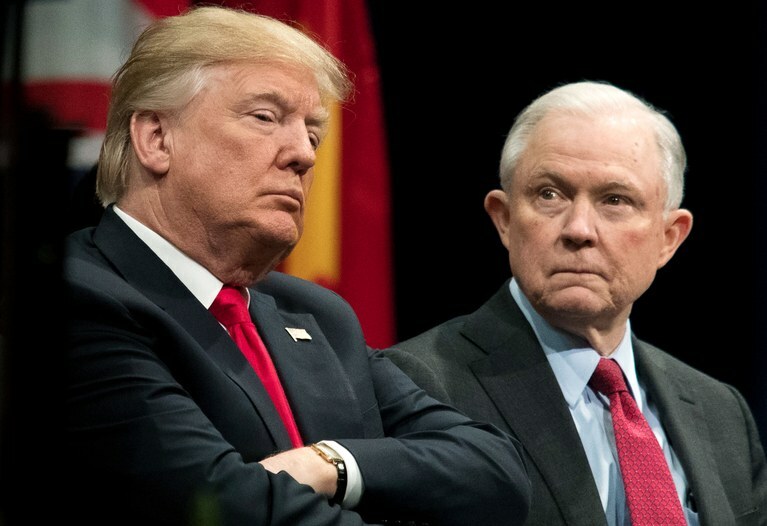 Sessions removal has long been rumored and with the midterms causing so much turnaround in the political arena, perhaps the Trump administration chose this time for a reason to request Sessions to recuse himself. One legal commentator speculated about how the Justice Department, and not Sessions' replacement Whitaker, might reduce Mueller's budget "so low that his investigation grinds to almost a halt." Good! They should have cut funding from this ridiculous witchhunt ages ago and diverted those funds to the border wall! Advisors who are close to Trump say that he has no plans on keeping Whitaker permanently as Attorney General. "I don’t see him staying," Trump aide said. "I think the president will be a lot more deliberate in interviewing potential replacements for Jeff Sessions."